CRÈME DE LA CANVAS: A full-canvassed men’s suit jacket in construction (PHOTO: Made Suits). Yet, when seeking out a quality custom men’s suit in Singapore, what is the first thing that comes to your mind? Do you seek affordability , CHEAPNESS? are willing to fork out for the highest quality fabrics and fit? In this post, we’ll introduce you to the world of men’s suit jacket construction. From fused to full canvassed men’s suit jackets, we’ll discuss the different types of suit jacket construction and why they should matter to you. Compromising quality for quantity, fused men’s suit jackets are a cost-effective method of production for the mass market. A fusible interlining is glued to the wool shell of a fused men’s suit jacket to impart a crisp, tailored look—albeit temporarily. The glue easily degrades over time, causing the wool to detach from the fused backing and ripple around the chest and lapels. This phenomenon is known as “fusing bubbles”. Inexpensive compared to canvassed jackets. You’ll also save money on taxes when you donate it. Stiff lapels on a stiff suit without the fluidity of a canvassed suit. You’ll look like a square, literally. Risk of delamination / bubbling. Bubbling is good for champagne on a celebratory night, not for your suit. UNSIGHTLY AND IRREVERSIBLE: “Fusing bubbles” on a cheaply made men’s suit jacket. Many men opt for the fused suit jacket to get them by a by a one-off business event or network meeting. It starts out making them look incredibly killer today, yet deteriorates as they wear it over time. Also, once “fusing bubbles” appear, it is nearly impossible to rid them. The fused men’s suit jacket ends up being worthless and thrown away after a short period of time. Ah, the crème de la canvas. The first disadvantage a full-canvassed men’s suit jacket is the time-consuming, expensive process. However, that is the first and only disadvantage; it has a plethora of advantages. Conforms to your body and fits better with time. Armor for the modern gent. Gives your jacket body the most fluidity and support. Good for businessmen and b-boys alike! No delamination or bubbling. De-lama-what? Yeah, none of that. More expensive to make = more expensive to buy. You might have to stay in a couple of Saturday nights to save up. Horsehair canvas is used in the construction of quality tailored men’s suit jackets in Singapore. Stiff and springy, a horsehair canvas interlining allows the suit fabric to drape naturally and impart a clean, well put-together look. First of all, the horsehair canvas interlining is cut and sewn, not glued, onto the suit jacket. From the padded shoulder all the way down the jacket body, the wool shell is stitched onto the canvas, ensuring that it moulds to your body. This allows the fabric of the entire suit jacket to move with you, as you move. A FULLY #MADEMAN: A full-canvassed lapel roll drapes nicely against the wearer’s body PHOTO: Made Suits). With age, quality horsehair canvas in a full-canvassed tailored men’s suit jacket should fully conform to your body, creating an excellent fit only for the #MadeMan. Why didn’t we put this one right after the full-canvassed section? Because a half-canvassed suit jacket has elements of both a full-canvassed and fused jacket. It’s like the Daywalker of suit constructions. 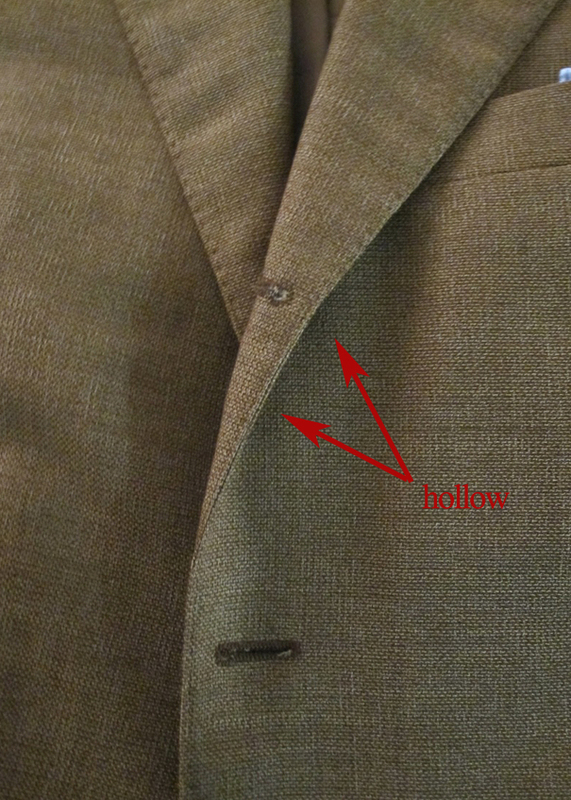 A half-canvassed suit jacket has a thin layer of fusible throughout the front panel of the jacket; on top of this layer of fusible, the front panel has a layer of canvassing stitched on that extends from the shoulder down through the chest. Good drape and shape in the chest. Cake. Usually less expensive than a full-canvassed suit jacket. Take your lady out on a date with those money you saved..
May be slightly stiffer than a full-canvassed jacket. Well, you can’t win them all. You may also encounter the “floating” canvas—a half-canvas alternative which has a piece of canvas with felt and other materials inside the chest, while everything else is fused. Without the important canvas structure and pad-stitching in the lapels, a “floating” canvas men’s suit jacket is not any different from a fused men’s suit jacket. 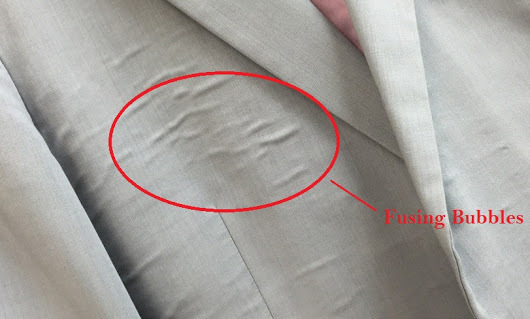 How Can I Tell if my Suit is Fused, Half-Canvassed or Full-Canvassed? You can grab a pair of scissors, pour out some liquor on the floor and yell “WHYYYYY? !” as you cut open your lining and actually look inside. Unfortunately, that would be the only sure way of determining how your suit jacket was constructed. But you just got that slick new custom suit and you love it so much that the idea of cutting it makes you want to cut yourself. So is there any other way to tell? Yes, but note that it is NOT a reliable method. It’s called the “pinch” test. Grab your suit between the buttonholes with one finger on each side and pinch to see if you can feel a layer of fabric between the inner lining and the outer suit fabric. If you can feel a distinct third layer that’s “floating”, then you may have a full-canvassed suit. If you don’t feel anything, you may have a fused suit. In either scenario, you may have a half-canvassed suit depending on how far down your selected haberdasher cut the canvassing and whether it overlaps with the chest piece. Compounding all of this is the fact that there are different types of canvas, some thinner than others, which could cause you to miss it. We did warn you. So your best bet to ask before you buy your next suit. If they can’t tell you, they shouldn’t be in business. How are MADESUITS Custom Suits Constructed? With a fierce attention to detail mixed with tender loving care of course! Kidding, but not really. 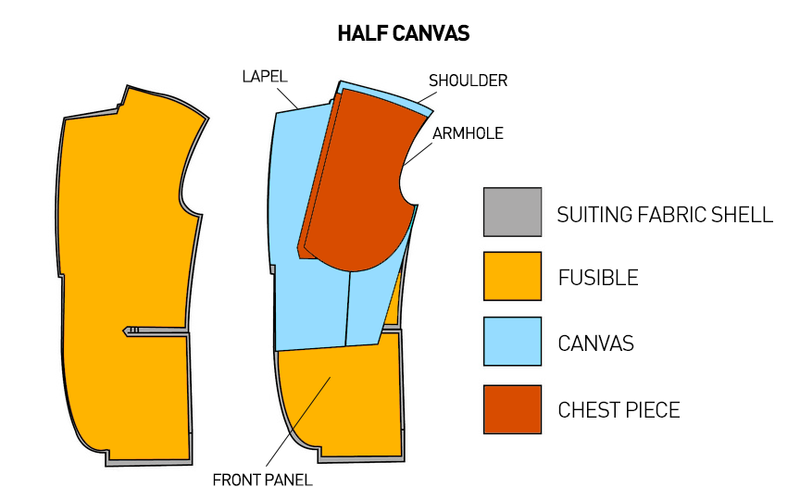 The standard construction of our custom-made suits is always a half-canvas jacket. Full-canvassed jackets are available at a TOP UP OF COURSE. We need to get PAID for the hardwork we put in. We’ve done multiple rounds of testing, diligence and quality control so you don’t have to worry about anything except looking good in your very own MadeSuits custom suit! Have a better idea about suit construction now? We hope so. Suit jacket construction is not something readily seen but it should never be overlooked. Like all things in life, quality starts from the inside out. Got a question on suit jacket canvassing? Leave a comment below! At Made Suits, the days of cheap, low-quality fused suits are long gone! Learn more about our custom men’s suit jacket tailoring, bespoke process here, and make an appointment today to experience first-hand the makings of a #MadeMan. this is a British button-two/show-one coat (or the American version of a 3 roll 2, where only the middle button is buttoned), which has a fullness of lapel around the buttoning point because, as you can see, the belly begins at the middle button. The 3 roll 2 is a favorite among gentlemen of substantial height (as a gentleman who is not tall should avoid too many buttons and pockets on a coat in order to avoid breaking the continuous vertical line of the suit) mainly for the reason that the third button plays a part in assisting the tailor to shape an elegant lapel belly roll. Such a roll is a clear signal of a hand-stitched lapel, for no machine-made or fused lapel is able to exhibit roll with this button in place. As it is preferred that the tailor will provide cleaning and care of your custom suits, at times this option is not available. It is not uncommon for suit owners to be mortified to find that some dry cleaners have pressed custom lapels on coats “flat”, after they come off the commercial press, literally obliterating the roll. If your tailor cannot care for your suit and you opt for a cleaning service, it is best to find a professional cleaner that provides a “sponge & press” service, which requires hand-pressing the garment according to its original shape. But, to play it safe, maintain your lapel roll at home. At Made Suits Our Lapel Roll shows a Huge Belly. BUT OF COURSE each tailor has his or her own method and preferences when making the lapel roll. The roll of the lapel is an aesthetic feature that is chosen based on the pleasure it gives to the eye : Smooth and precise lapel rolls of different lengths and depths are offered by some of the finest tailors in the world. It’s up to you to decide what looks good with your own eyes.